We’re continuing our look back at the 2018 season by highlighting the guys who took the biggest leap this past season. From year one to year two is generally accepted as the biggest jump in player development, but as we see from the list below, everyone progresses at their own rate. 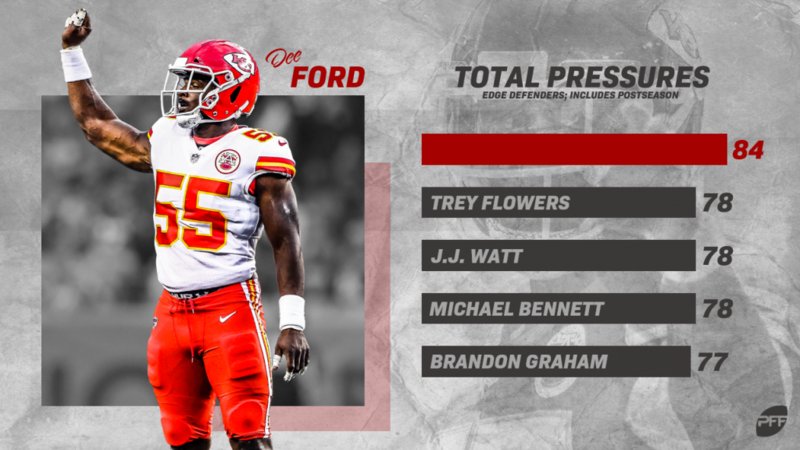 To see where your favorite team can improve their roster this offseason, grab a PFF Edge or Elite subscription today to reserve your copy of the 2019 NFL Draft Guide! 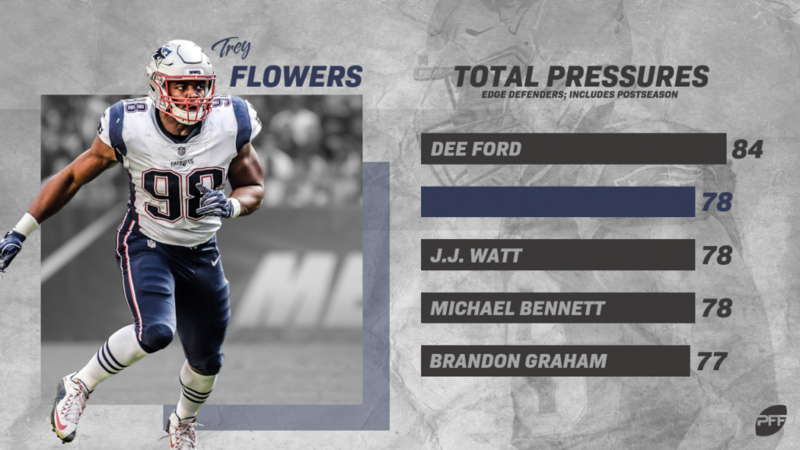 Flowers went from a solid run defender and pass rusher to high-quality in both regards this past season. He set career-best marks with 78 pressures and 32 run stops including the playoffs. Howard has always teased big-time potential in the past, but never quite put it all together. This past season, he racked up career-highs with seven picks and eight pass breakups in only 12 games. Hughes somewhat quietly put together one of the most dominant seasons of any edge defender in the NFL this season. He racked up 74 pressures – 13 more than his previous career-high – and finished with a 90.4 pass-rushing grade. Not bad for the 30-year-old. As a rookie, Adams showed the skillset that made him a top-10 pick, but he was asked to do more than he could handle at times. However, this past season, there was no assignment he couldn’t handle. 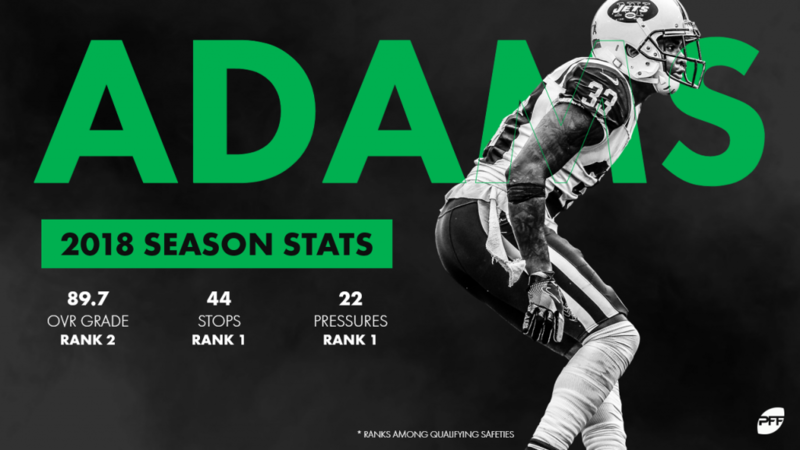 Adams led all safeties with44 total stops and 22 pressures as a blitzer. Ford’s rough 2017 season saw him struggle to a 59.4 overall grade, which is about where he’s been for the majority of his career. However, Ford had a breakout year of epic proportions in 2018, raising his overall grade to a career-best 87.7 overall grade. Parks is the model for the modern dime linebacker. It took him a couple of years to get used to the role, but he notched a 74.0 overall grade this past season. Cook has always been somewhat of an enigma, as his talent never quite matched his production. That finally changed in 2018, as the 31-year-old earned a career-high 75.7 overall grade in Oakland. After a 2017 season that looked like Mebane might be at the end of his line, the nose tackle rebounded nicely. He was back to his solid, run-defending self and registered a run-defense grade of 67.7 – 12.4 points better than his 2017 mark. Smith broke out just in time for his impending free agency. His 10 sacks, 17 hits, and 34 hurries all represent career-high marks. Davis had nowhere to go but up after his 47.3 overall grade in 2017 saw him as the lowest-graded safety in the NFL. 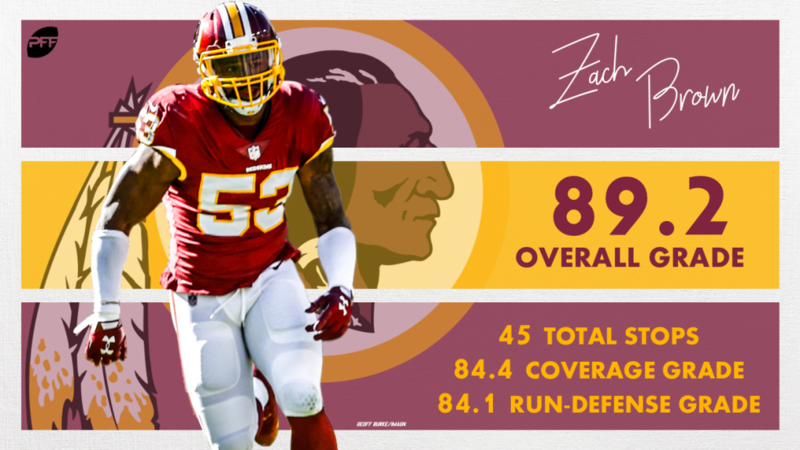 He cut down his missed tackles from 19 in 2017 to only 12 in 2018 and improved across the board. Higgins looked like the Browns’ number one receiver at times throughout the 2018 season. It was a far cry from the player who was blanked for multiple games back in 2017. In Billings’ first year of NFL action, it was clear he wasn’t ready for the speed of the game. This past season, he looked more like the player we saw at Baylor. He racked up 22 run stops compared to only seven in 2017. Jackson was moved all over this season in Houston, and the result was a career-best performance. The former first-round pick played full games at safety, outside corner, and slot with ease. Call this the Andrew Luck bump. Hilton’s downfield prowess was wasted with Jacoby Brissett under center, but with Luck, Hilton ranked third, league-wide, in deep receiving yards. Rookie first-rounder Rashaan Evans was supposed to come in and lead their linebacking corps, but Brown took the reins himself in Year 2. The former fifth-rounder earned an 84.5 grade in coverage. The Jags didn’t’ have anything resembling a reliable receiving threat this season, but Westbrook was the closest thing to it. He came on strong down the stretch with three-plus catches in each of the last six games. The position switch did wonders for Jones, and it made many wonder why he ever moved to safety in the first place. Jones’ combination of size and speed led to him being a first-team PFF All-Pro corner. This one is more a factor of no one else on the Eagles taking much of a step forward. A lot went right for the Eagles to win the Super Bowl and unfortunately this past year a lot went wrong. Jeffery’s big deal was not one of those things though, as he hauled in 71.7 percent of his targets compared to 52.7 percent a year ago. Brown’s career has been very much up and down, with 2018 being the pleasant upswing. He missed only four tackles on 95 attempts after missing 14 a season ago. The raw numbers may not have matched what Engram put up as a rookie, but his efficiency was much better. He only dropped three passes compared to 11 as a rookie, and he had a passer rating 33.2 points higher when targeted. 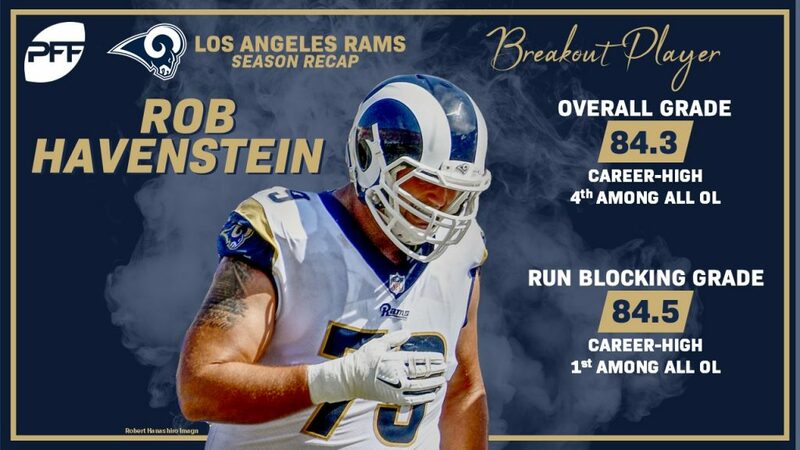 Havenstein went from quality right tackle to in the conversation for best right tackle in the league. He set career highs in both run-blocking and pass-blocking grade. Lockett finally looked fully healthy and had one of the most efficient receiving seasons ever. He had a perfect passer rating when targeted and didn’t drop a single pass on 61 catchable targets. Kittle is the poster boy for the second-year jump. While he was a surprise as a rookie, Kittle dominated in Year 2 – even without Jimmy Garoppolo – leading all tight ends in receiving yards. Starting all 16 games this past season, Peterson set a career-low for receiving yards allowed with only 364. Jackson came out of seemingly nowhere to win PFF’s best coverage defender in the NFL award. His 15 combined picks and pass breakups were far and away the most at the position. The former second-rounder had a rough go of it his first couple years in Minnesota before finally settling into the slot role this past season. He broke up eight passes and didn’t allow a touchdown in his coverage. 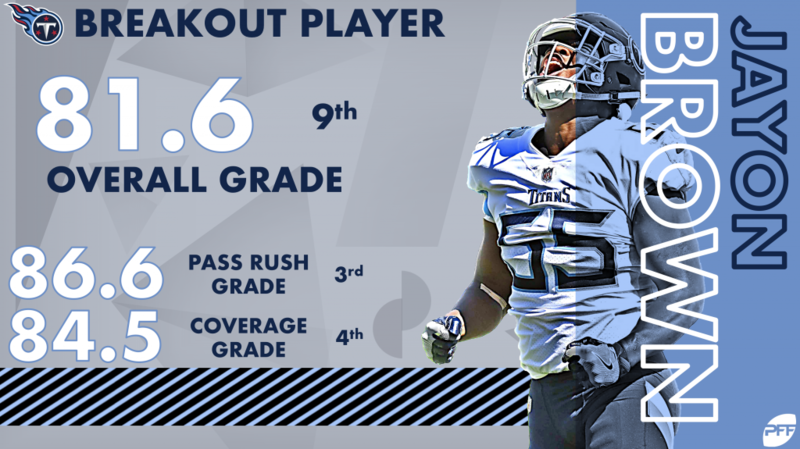 McCray was forced into a starting job in 2017 that he truly wasn’t ready for after switching between guard and tackle. When he did see the field down the stretch for Green Bay this year, he was much more comfortable in pass protection at guard. Robinson still isn’t quite there as a pass rusher, but his run defense took a big leap forward this past season. He notched the same amount of run stops (25) on 81 fewer snaps against the run. One of the keys to the Saints’ defensive success this season was the improved play of their linebacking corps. Klein had his role expanded and responded with six more defensive stops and four fewer missed tackles than the year before. Hooper set career highs for receptions (71), yards (660), and touchdowns (four) while only dropping two passes. The journeyman defensive tackle had a career-year against the run. His 80.4 run-defense grade outpaced his previous career-high by 11.8 points. Howard’s struggles as a rookie came as a run blocker where he was one of the lowest-graded in the NFL. He improved mightily in that regard and also finished third among all tight ends in yards per route run (2.26).